Do you have to pay that old debt? Do you really owe that debt? PHOENIX — Are you still responsible for old debts? Maybe it's a car or some other loan that you didn't fully pay off. After a certain time period, some debts can expire. 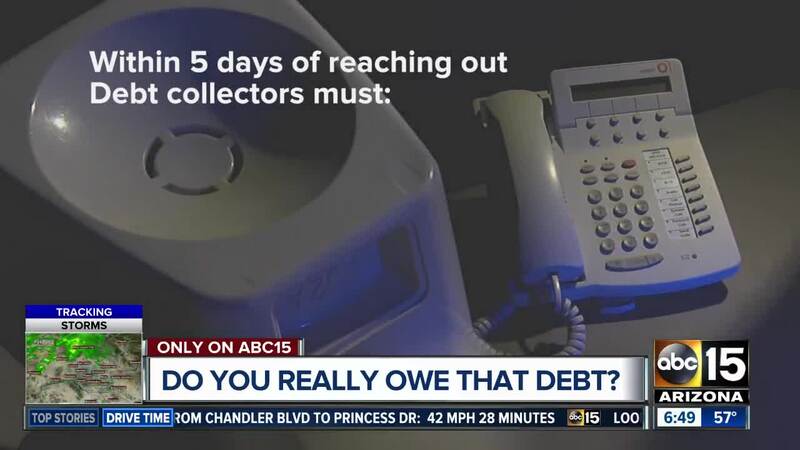 But people around the Valley are still getting calls from debt collectors wanting them to pay. Some bogus collectors are even making up debts, or threatening with jail time. Many debt collectors are just doing their jobs, but there are laws around what they can do or say. Among those laws, debt collectors must identify themselves. They must also state the amount owed and who is owed and they should give you a 30-day period to dispute the debt. If you do, they must then send you a receipt or proof of the debt. They also can't harass or threaten and they must not continue to contact you if you told them in writing to stop. That doesn't mean they have to give up trying to collect a debt. While most debts will stay on your credit report for seven years, debts can expire between three and six years. If it's legitimate, you would still owe the debt. Collectors could still try to collect and you could be sued. But, if it's expired, in most cases they couldn't force you to pay. Click here for more about your debt collection rights.